After making bodhrans for 19 years, we have decided (for a number of reasons) that the time has come to step back from the business of making drums. Because of this, we will be virtually stopping 'Belgarth' bodhrans as of 2014, and it will revert to being a hobby, which will be fitted in with other things we plan to do e.g., grandchildren need to be visited often. We are working on a way to get Belgarth Bodhrans back in regular production, but that involves family members and 'when the time is right'. As we start a long break at the beginning of December, anyone wanting to order for Christmas would be advised to do so in plenty of time for us to complete the drum and have it sent out. As a guide, any order taken after mid-November would be difficult to complete. We wish to thank all our customers who have allowed us to make bodhrans as a career and to have sent 3,300 drums to all parts of the world. Thanks also to those whose expertise, in various fields, has helped us create the thing we are most fond - the 'Belgarth Bodhran'. We will be back in another guise, 'when the time is right'. Welcome to Belgarth Bodhrans' website. Based in the Orkney Islands, we have been making bodhrans professionally since 1996 and now export throughout the world. 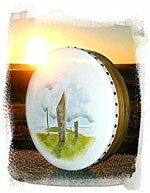 A special edition Belgarth Bodhran drum created for a customer in the USA. As well as providing full details of our range of bodhrans, the site now gives a little background to the manufacture of our drums and lists our other products. We hope you enjoy your online visit and if you have any queries about any of our products, please don't hesitate to get in touch. And if there are any website visitors who ever find themselves in Orkney, we are always pleased to welcome folk to Belgarth. The bodhran, pronounced bow-rawn or boran, is an ancient single-headed frame drum. 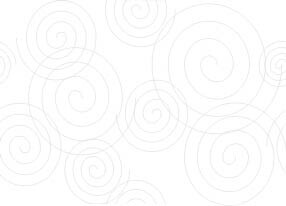 Although variants of this design are found in many cultures, the bodhran is usually associated with Irish music. That said, the bodhran is now used to good effect in many different musical styles and has come to be recognised as a versatile musical instrument.